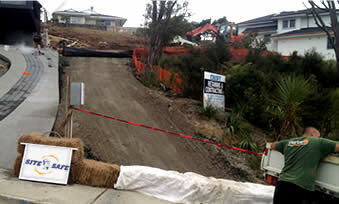 At Linwood Contracting we specialise in retaining walls and earthmoving for residential landscaping jobs in Auckland and Northland. Extensive experience with a wide variety of residential & civil contracting jobs means high quality workmanship from our reliable and knowledgeable team. Being a small team allows us to really look after you, even after we’ve completed your project. When you call, we’ll pick up the phone. If you need a job done ASAP, we’ll come on site and provide a quote within 24 hours - and we’ll work to a schedule that suits you. 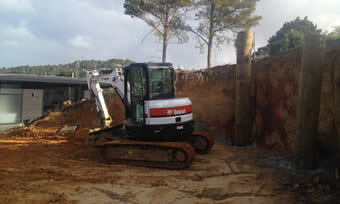 From wooden retaining walls, to major earthworks and house cuts, we can work to any size job - and to fit your budget. CALL NOW AND GET A QUOTE WITHIN 24 HOURS! Despite some wet and unfriendly weather the retaining wall job was very well done and finished on time. The site to work on was not the easiest but they have managed that problem very well. In the construction industry there can be a lot of risk - that’s why we take our safety very seriously. We’re up to date with all required health & safety regulations and are proud to be a member of Sitesafe. We update our fleet of trucks, diggers and other small machinery on a regular basis. You can be confident that we’re using the best quality modern vehicles and gear, which will get your job done quick and painlessly. 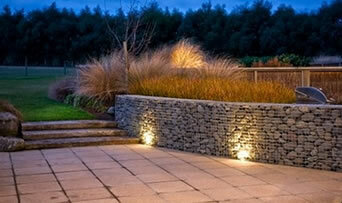 Check out our latest retaining wall, gabion stone wall and driveway work in our projects gallery.